Both starting flights at the EPT Barcelona Main Event have now finished, and Dragon Kostic will still hold the chip lead when Day 2 gets underway later today. Kostic remains the only player out of the remaining 728 player field to have a stack of over 200,000 chips, with 215,000 to his name. He is followed on the chip ladder by Florian Dimitrie Duta, who has the distinction of being the chip leader on Day 1B, with 187,000 chips. 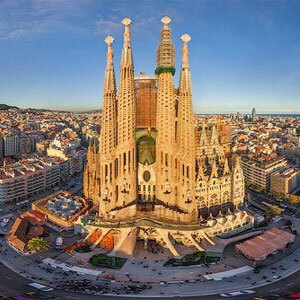 While that was a solid achievement by Duta, it was overshadowed by the confirmation that this year’s turnout at the EPT Barcelona Main Event was the highest for any EPT Main Event field in the Spanish city. A total of 708 players turned out to play the second starting flight, slightly higher than the 518 who turned out to play on Day 1a. That put the total field at this year’s Main Event to 1,226, which is a significantly higher field than last year’s event, whose field of 1,082 was previously the highest yield of any of the Main Events to be held in Barcelona. Maksim Bura was second on the chip ladder at the end of Day 1b, finishing the day with a stack of 160,600. Not far behind was Daniel Reijmer, who will go into the second day of play with 142,100 chips. One player from the second starting flight who did not make the cut to Day 2 was poker legend Daniel Negreanu. The man known as Kid Poker was eliminated on Level 6 after Negreanu reraised to 3,800 before the flop with A♦ J♦ before being called by another player, who had A♥ 7♥. While the first-ever WSOP Asia Pacific Main Event winner was ahead, that soon changed after another Seven was shown on the flop. That was enough to eventually give his opponent the hand while eliminating Negreanu from the Main Event. Negreanu may not have made as much progress as some may have expected, but 2008 WSOP Main Event runner-up Ivan Demidov certainly has. The Russian made it to Day 2 of the Main Event after a solid day of play on Day 1b. Demidov finished with a stack of 45,500 to his name, which is not a massive stack compared to others in the tournament but is certainly enough to make him a potential threat to everyone else in the event. Day 2 of the EPT Barcelona Main Event is set to resume later today at the Casino de Barcelona.